1 -- What is Railroad Workers United? Railroad Workers United (RWU) is a cross-craft inter-union solidarity caucus of railroad workers across North America. We are drawn from the rank-and-file working on all the major rail carriers. RWU members hold a union card in one or the other of the rail unions and work in one of the crafts. RWU also accepts members from the ranks of retirees, spouses, family members and significant others of working railroaders, as well as railroaders on unorganized railroads who wish to one day be unionized. All must subscribe to the RWU Statement of Principles. 2 -- Is Railroad Workers United a new union? Railroad Workers United is NOT a union. While there are numerous railroaders who are disgusted and discouraged by the state of affairs within our unions, RWU believes that union members should work for change within their existing unions. Also, there are numerous things we can do to build solidarity and unity, to fight for justice on the job, to win better contracts both within the existing framework of the unions and outside of that framework. Solidarity existed long before there ever was an official and legally recognized union structure. RWU, in effect, wants to "get back to basics" - unity, solidarity, democracy, member education, rank-and-file action. 3 -- Who is responsible for first organizing RWU? Railroad Operating Crafts United (ROCU) and its allies, together with other railroaders, family members and retirees who wish to build a fighting labor movement that can take on the carriers and win. 4 -- When was RWU organized? RWU first got organized in November of 2007 as the RWU Organizing Committee. we were the RWU Organizing Committee until April 11, 2008, when we were formally constituted as RWU at our Founding Convention. 5 -- What does RWU hope to achieve? Railroad Workers United is a movement which wants to rebuild the spirit of solidarity which is sorely lacking today, not just on the railroad, but in the labor movement generally and in society as a whole. We hope to build a movement across crafts and between unions which is capable of effectively confronting the carriers. We want to infuse the spirit of democracy throughout all of our unions. We are pledged to democratic "reforms" which put the power of the union into the hands of the rank-and-file members. RWU aims to rebuild union power in order to win good contracts, dignity on the job, and good wages, benefits and working conditions on all rail properties in North America. 6 -- How does RWU expect to achieve its goals? Does RWU have a strategy? · Support candidates, who actively support RWU goals and principles, for leadership positions in the various unions. · Build unity between unions at the next (and every subsequent) round of bargaining. · Act as a solidarity organization locally, regionally and nationally by building awareness and support for each others' job actions, strikes, etc. · Develop a newsletter to be distributed continent wide with news and views about the rail labor unity movement and various struggles across North America. · Develop and maintain an up-to-the-minute website to augment the newsletter, providing railroaders with timely information about rank-and-file issues. · Support mergers between rail unions where they make sense (i.e. build toward a more industry-wide type union) and empower the rank-and-file. · Build local chapters in terminals to more effectively recruit new members, build solidarity at the base, and support the general organization. · Get behind national legislative campaigns that would benefit rail workers, facilitate union organizing, and benefit the working class in general. 7 -- Who can join RWU? Membership in RWU is open to all railroad workers in North America. Retirees, spouses and other sympathetic family members are also welcome to join. Membership is NOT open to railroad managers or others who are affiliated with the rail industry in a management capacity. 8 -- RWU includes Rail Workers from Canada and Mexico as well as those from the U.S. Why? The two major Canadian Carriers - the Canadian Pacific and the Canadian National-- have important mainlines and affiliates in the U.S. The CN owns the IC, and in 2007 the CP purchased the DME and the ICE. Similarly, major U.S. carriers including the Union Pacific and the Kansas City Southern have purchased major mainlines throughout Mexico. More and more, especially in the face of NAFTA, transborder freight traffic is booming. As the carriers become more and more international in scope and as freight traffic becomes more and more transborder in nature, it becomes imperative that labor begin to think and to organize internationally as well. Railroaders in North America share a common industry and a common interest. We work for the same employers. We face the same issues. And the carriers - who have long played us off against one another -- by craft, by union, by terminal and by carrier - will now play us off country against country. Therefore, RWU welcomes all North American railroaders into its ranks. 9 -- RWU includes retirees and spouses as members. Why? Retirees and spouses have a direct interest in the strength and power of our unions for obvious reasons. While they do not directly make their living from working on the railroad, their standard of living and quality of life are directly tied to the success or failure of organized labor. They are vital allies of all railroaders and as such are welcome into the ranks of RWU. 10 -- RWU allows unorganized railroaders to apply and hold membership in the organization. Why? There was a time when practically all rail labor in North America was union. However, through spin offs, privatization, and short-line creation, hundreds of properties now operate non-union. However, just because a property is not organized, this does not mean that its employees are scabs or anti-union. In fact, as many recent spin-offs have shown, the workers on these lines are ready, willing, and able to become part of the labor movement. They should not be excluded from RWU simply because they have yet to be formally organized into a bargaining unit. They are welcome in the RWU. 11 -- What unions do the members of RWU belong to? · United Transportation Union (UTU), the largest rail union, which represents most trainmen and yardmasters and some engineers, now scheduled to merge on January 1, 2008, with the Sheet Metal Workers. · Brotherhood of Locomotive Engineers and Trainmen, (BLET), an affiliate of the Teamsters Rail Conference. · The Brotherhood of Maintenance of Way Employees (BMWED), also a member union of the Teamsters Rail Conference. · Transportation Communication Union (TCU), itself an amalgamation of seven previous rail unions. (TCU is an affiliate of the Machinists union). · Brotherhood of Railway Carmen (BRC), the largest TCU affiliate. · Brotherhood of Railroad Signalmen (BRS). · American Train Dispatchers Association (ATDA). · International Association of Machinists (IAM). · International Brotherhood of Electrical Workers (IBEW). · Sheet Metal Workers International Association (SMWIA). · International Association of Boilermakers, Blacksmiths, Iron Ship Builders, Forgers & Helpers. · National Conference of Firemen & Oilers (NCFO), an affiliate of SEIU. · Transportation Workers Union (TWU). In Canada, this includeds most of the unions listed above plus the Teamster Canada Rail Conference (TCRC), the Canadian Auto Workers (CAW) and the United Steel Workers of Ameirca (USWA). In Mexico, most railroad workers hold membership in the Mexican Railraod Workers Union (STFRM). 12 -- How much are RWU dues? Dues are currently set at $50.00 a year. Dues rate is subject to amendment at the founding convention in 2008 and every bi-annual convention thereafter. Local Chapters may also establish a dues structure to support the local chapter as established by the local/regional chapter membership. 13 -- What do you get as a member of RWU? When you join RWU, you know that you have joined an organization of some of the most forward thinking railroaders in North America. You have made a clear commitment to take a stand in favor of unity, solidarity, democracy and action. When RWU receives your membership application, you will receive a phone call from one of our organizers. In the mail you will receive a letter of welcome, a RWU membership card, a copy of the RWU Statement of Principles, the latest RWU newsletter, a copy of the RWU Bylaws and other basic information. You will have the right to receive "members only" emails concerning the direction and activities of the RWU. You will have the right to run for office and the right to attend the bi-annual convention and vote for the International Steering Committee. 14 -- Do I have a right to join RWU? All those who are eligible, who support RWU, agree to abide by its constitution, and who agree to the RWU Statement of Principles have the absolute right to join RWU. All union members who carry a union card in any craft union and work for the railroad in any capacity have the right to join. 15 -- Is RWU a "dual union"? No. As stated above, RWU is NOT a union, is not recognized as a union by the National Mediation Board, has no representation rights and holds no contracts. Therefore, RWU is not a dual union and cannot be accused of being one. 16 - What if I am harassed by management and/or my union officials for participating in RWU? Politely and firmly explain to them that you have the right to participate in any organization of your choosing, as guaranteed to you in the U.S. Constitution. Then immediately contact RWU for advise, assistance and support. 17 -- How can I play a role in RWU? First, if you believe in the RWU mission and Statement of Principles, please join. As a member, you can build RWU and spread the word by downloading and copying RWU literature, putting out flyers, posters and stickers, distributing and writing for the official newsletter, making a financial donation, participating in the life of the local chapter (if one exists in your area),helping to build a local chapter where none exists, taking part in standing and special committees of RWU, taking part in regularly scheduled conference calls, running for a seat on the International Steering Committee, and working on RWU campaigns as they are launched and carried out. Really, the degree to which you participate is practically limitless! 18 -- What is/was Railroad Operating Crafts United (ROCU)? Railroad Operating Crafts United (ROCU) was a group of rank-and-file members of the operating crafts who got organized in the spring of 2005 to end the inter-union conflict between the UTU and the BLET, to merge the two unions into a single, powerful and democratically organized union. In its 30 or so months of existence, ROCU won some victories and managed to build a network of trainmen, yardmasters and engineers around the U.S. and Canada (see the website page "RWU History"). However, ROCU's mission of a single united union of the operating crafts foundered on the UTU and BLET leadership’s insistence on warring with each other and remaining apart. When the UTU voted to merge into the Sheet Metal Workers Union, ROCU decided that rather than continue to fight what now appeared as a losing battle, and rather than disband, that we would broaden the struggle, reach out to our brothers and sisters in the other unions, and build a solidarity and unity caucus of railroaders from all crafts, all carriers, all unions, and all three countries of North America to fight the carriers. 19 -- What is the Relationship between RWU and Railroad Operating Crafts United (ROCU)? ROCU officially dissolved in November 2007. Numerous rank-and-filers that were involved in ROCU have become active now in RWU. The goals of ROCU and RWU are similar. The major difference is that RWU is multifaceted while the primary goal of ROCU was the unification of the BLET and the UTU. While RWU in principle still supports the idea of BLET-UTU unity (and for that matter, unity of all rail unions), the bailiwick of RWU is far broader. 20 -- How are decisions made in RWU? At the founding convention on April 11, 2008, the delegates present elected a Steering Committee and an Executive Committee to guide the organization over the next two years. When the Convention is in session, it will be the highest decision-making body of the RWU. Every month, there will be either an Executive Committee Meeting or a Steering Committee meeting to conduct the business of the organization. Within RWU local and regional Chapters, decisions will be made by the RWU members present at the meetings of the Chapter. 21 --Are union leaders from the various craft unions involved in RWU? Yes. While most members of RWU are rank-and-file members of the various unions, a number of RWU members hold office in their local union, including local chairmen, local presidents, vice-presidents, delegates, secretary-treasurers and others. We have the sympathy and support of a number of union officers at higher level as well; however, many of them have refrained from joining outright because of internal political concerns. 22 - Is any specific union behind the creation of RWU? No. 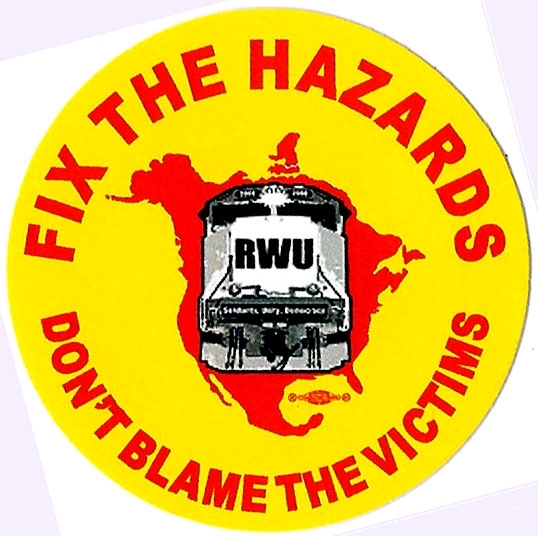 None of the rail unions in North America or their parent affiliates are involved in the creation of RWU. At this point, none have officially endorsed RWU. 23 - How is RWU funded? The primary source of income is from annual membership dues of RWU members. The remainder of funding comes from donations from RWU members and other railroad workers who, while not formally joining, support the efforts of RWU. RWU sells T-shirts and other items with the RWU logo that raises money for the organization. 24 - How do I contact RWU? -- You can call and leave a voice message anytime day or night at: 206-984-3051. -- Email for more information to: info@railroadworkersunited.org. -- See the RWU website at: www.railroadworkersunited.org. 25 - How do I join RWU? You can download the application form from the RWU website from the "Member Application" Page, fill it out and together with your first year's dues, mail to Railroad Workers United P.O Box 1051 Salem, IL.62881. Or you can join on-line by going to the RWU website on the "Join RWU On-Line" Page and filling out the on-line form. Click on "Send" and then submit your dues on-line via PayPal or send a check via U.S. Mail. 26 - How do I make a financial contribution to RWU? It's simple. Just mail a check, made payable to Railroad Workers United, and mail to RWU at P.O. Box 1053 Salem, IL. 62881. Or you can donate online via PayPal by going to treasurer@railroadworkersunited.org, as well as clicking the "Donate" buttons throughout our website.